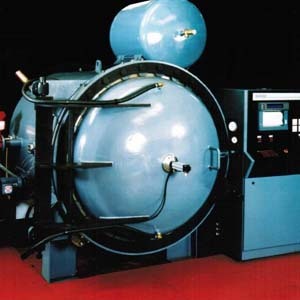 In our vacuum furnaces and air tempering. This is a process usually performed on a selection of aluminium alloys and various stainless steels. The mechanical properties are improved and in some alloys the corrosion resistance can be improved but at the expense of component strength. Heat treated in air and the following times, temperatures and conditions are for guidance only. For more specific details please contact us. To put the material in the solution condition it is usually heated to between 495°c to 545°c for a predetermined number of hours and quenched rapidly in hot water. From this condition the material will naturally age harden at room temperature (T4) if left long enough or can be precipitation hardened to accelerate the hardened condition (T6) by heating to between 150°c to 200°c for several hours. PH and other grade steels are usually bought already in the solution, or A, condition allowing you to have us precipitation harden the bar or components to your required hardness or tensile strength. If a solution heat treatment is required it is possible to process the bar or components and depending on the base material the component is heated to between 925°c to 1065°c in our vacuum furnaces followed by a rapid gas quench. The necessary precipitation hardening process is dictated by the condition you require and is generally heated between 482°c and 580°c for between 1 to 4 hours. The temperatures and times are for guidance only and please contact us for more specific details.